It’s a common scenario: you’ve made the decision to relocate to Thailand but face the heart wrenching decision regarding whether to leave your pet at home, or bring them along for the adventure. Moving a pet abroad has to be one of the most anxiety inducing things you can do. So, before deciding what you will do with your much loved companion/s when relocating to Thailand, there are a few questions you should ask yourself. How old is your pet? If your pet is elderly, you must decide whether it is in its best interests to take your pet with you to Thailand. Is your pet in good health? If your pet has any underlying health conditions, then it may not be considered fit to fly to Thailand. You should also take a responsible view on this yourself as the pet owner. Is your pet safe in Thailand? For example, if you have a domesticated cat and allow it to roam the streets back home then adjusting to life in Thailand will be difficult for your pet. Most cat owners decide to keep their cats safely indoors if this is the case. Is there space to walk your dog? Walking a dog along the busy streets, bustling with vendors and traffic can prove to be a taxing task. Check that there will be areas available for you to walk your dog in the local area. Will your pet cope with the climate? Thailand has a very hot and humid climate. Keeping your pet in air-conditioned rooms and in the case of dogs, being able to walk them at cooler times of the day, can help. Will you be able to find suitable accommodation for your pet? Finding accommodation in Thailand, which is pet friendly can present a challenge. Many condominiums and some house rentals don’t allow pets. Armed with the above, you have now decided that exporting your pet to Thailand is the decision that you are going to make. Here is what you need to action in order to make it happen. Each different country will have its own regulations as far as vaccinations go, so always do your homework and prepare in plenty of time to ensure your pet is vaccinated in the correct way. Some countries will insist that the vaccines are given several months in advance of travel, so it’s one of the first things to check off the list. 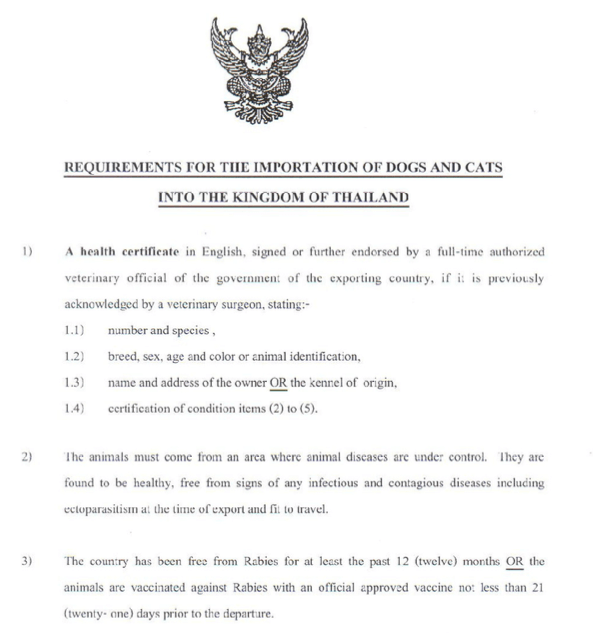 The best resource for information on Thailand pet vaccinations is the ‘Department of Livestock Development’ located at Suvarnbhumi airport in Bangkok. Alternatively, you can contact a veterinary officer at the airport, for up-to-date information. Distemper, infectious hepatitis, parvovirus and rabies. Rabies and Feline Panleukopenia Virus (FPV). Vaccinations need to completed at least 21 days prior to flying and within one year of departure. You will need proof of these vaccinations, including the vaccination manufacturer, the batch number and expiry date of the vaccination. Pet passports or vaccination certificates are a great way to store and evidence this information. The Pet Travel Scheme was introduced to allow the transportation of pets without the need for quarantine. 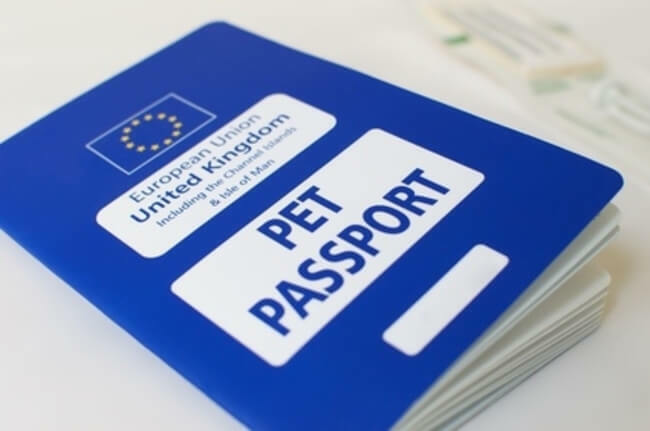 Pet passports are available in many countries including: The United Kingdom, European Union Countries, United States Of America, Canada, Australia and New Zealand. Most veterinary practices can complete a pet passport for you. This will detail all the relevant information about your pet, as well as their vaccination history needed for exportation. Pet Import/Export Permits Thailand – Do You Need An Agent? This is a matter of personal preference. An agent can take a lot of the hassle out of exporting a pet but generally speaking, an agent will only deal with the export of your pet. An agent’s services can include: booking flights, collecting your pet from a cattery or kennel, applying for export and import permits and completing the paperwork prior to flying. It can also include the sourcing of an approved flight crate and ensuring your pet makes the flight in a safe and timely manner. Once your pet arrives in Thailand, you may want to consider hiring an agent to deal with the import process. 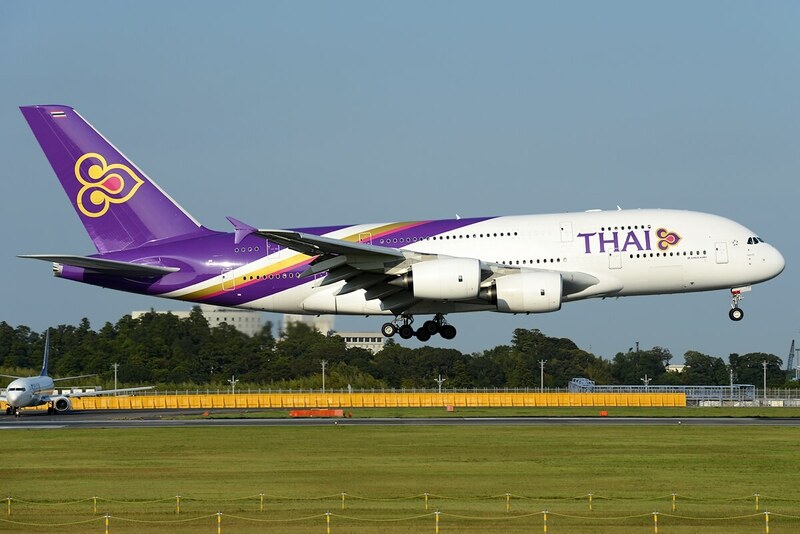 You can hire an agent before arriving in Thailand or at the airport itself. We recommend the latter, as it could save you money. The language barrier is a problem for most foreigners and there is a strict process with several steps that need following before you are permitted to take your pet home from the carrier’s warehouse. It is worth noting that there is a requirement to fill out a huge amount of paperwork – some of which is written in Thai. Paying someone at the depot to handle this for you is definitely recommended, to help avoid unnecessary delays. You will need to apply for an import permit for your pet within 60 days of travelling but no less than 7 days prior to arrival in Thailand. You can email the ‘Department of Livestock Development’ at Suvarnabhumi airport Animal Quarantine to obtain an application form. When sending an email, try to include the following information. They want to know your pet’s travel plans before sending you an application form. The flight number and company name, including the Air waybill number. You will also need to complete a written declaration stating that the animal has been a resident in your home country for at least the last six months or from birth. This will vary depending on which country you are exporting from. You will need to provide a health certificate, which is completed by an approved vet within 72 hours of flying. This also certifies that your pet is fit to fly. All good airlines will insist on examining your pet prior to flying to ensure that your pet’s health has not altered. You will be provided with a certificate to prove that there have been no outbreaks of certain diseases in your home country. A serious and recent outbreak could prevent your pet being imported to Thailand. If your pet is not on the same flight as you and is travelling out later, you will need to arrange a suitable place for it to stay until the flight. Depending on the country you are leaving, there is normally a good range of kennels and catteries in close proximity to the airport that will ensure your pet gets to the airport in a safe and timely manner. If you have booked an agent, then they will be able to book suitable accommodation for your pet. Having your pet quarantined for up to several months is a concerning thought and one that should be considered carefully. Currently, if your pet is correctly vaccinated as per the regulations, your paperwork is all completed correctly and your pet arrives fit and healthy, there should be no need for your pet to be quarantined in Thailand. Always check with the ‘Department of Livestock Development’ for up-to-date information and for specific information. Getting it wrong could mean that your pet is transferred into quarantine and you will be liable for the bill. Pet import charges in Thailand vary depending on how much of the process you complete yourself and depending on what pet you are importing. When working out the cost, factor in the following: We have provided some estimates, based on importing a cat to Thailand from the United Kingdom. 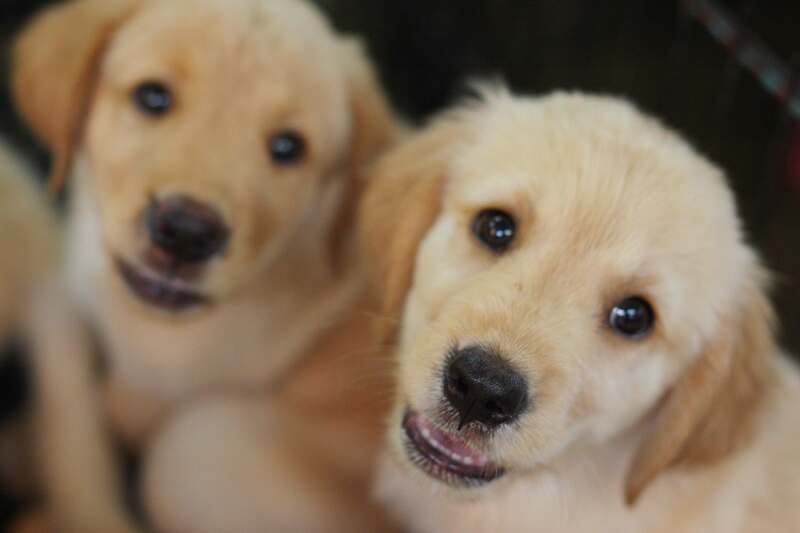 Microchip – If your pet is not microchipped, you will need to factor in this cost too. Ring your vet and ask whether there is a vet registered at the practise to complete pet passports and export paperwork and what the total cost will be. Estimated Cost: £20-50 but free in some cases. Customs – You will need to pay an import duty when your pet arrives in Thailand. In our experience it is 30% of your pet’s value, however you should check for up-to-date information on the cost before arriving. You will need to provide an invoice for the purchase price of your pet, as this will be used to work out the import duty. If you do not have an invoice available, then the customs department will calculate the value of your pet, which is likely to be higher than the actual cost to you. Estimated cost: 30% of the value of your pet/s. Administration and Storage – You will also need to pay a small fee to enter the import area and for the storage of your pet. Estimated cost: Less than £100. Create a check list and tick off each item of paperwork required as you put it into your pet’s document folder. Photocopy all of the documents. Make sure you have every document with your pet and that you have a copy of every document too. Check whether the original needs to travel with your pet or whether you will need to present the original document at the airport. Leave ample time for vaccinations and check the timescales carefully for when paperwork should be submitted. If you have any Thai speaking friends take them with you to the airport to collect your pet. 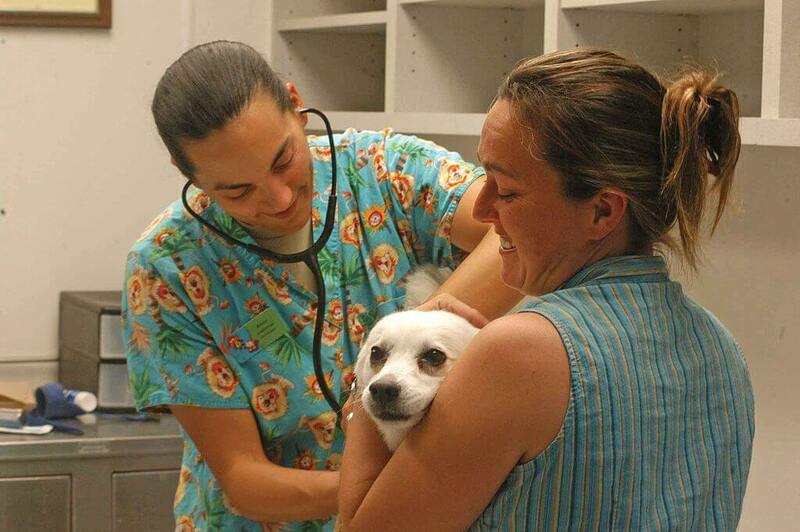 It will ease communication and any paperwork issues before your pet is released. Think about how you will transport your pet from the airport to your new home. Be Patient: Thailand has a very relaxed culture and as such things don’t always move at a swift pace. Accept the fact that certain processes could be very different to your country of origin. Have you relocated a pet to Thailand? How did it go? Find Thai Property will help you find the perfect pet-friendly condos and houses for sale and to rent from our offices in Bangkok. Our speciality is assisting overseas buyers in the purchase of Thailand property.